This is the one that started it all, our oldest beard wax recipe. Blended with locally harvested beeswax and a host of organic oils and butters to give your beard a nice shine, control, and condition while helping to eliminate the crazy rogue beard hairs that seem to have a mind of their own. Our original recipe will leave your beard with a light natural masculine scent, have you looking good all day, and your girl will be smiling and swooning in awe at your majestic whiskers. Needless to say, we know beards. Long before the current beard trend, way back before the 60's and 70's, and long before the 20th or 19th century for that matter...beards have been an integral part of Amish culture. The care for these beards have been passed through generations of men. 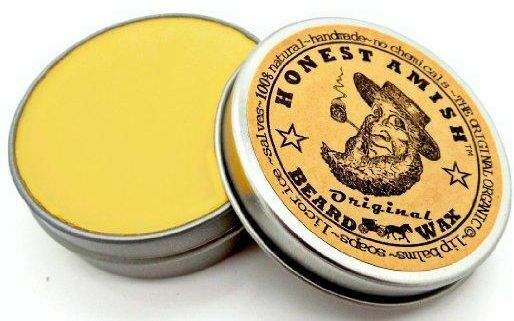 Honest Amish Beard Waxes are blended from premium organic oils, fruit and nut butters, essential oils, botanical additives, and locally harvested beeswax. These recipes were created centuries ago to help maintain, care, and control growing beards while protecting and conditioning the hair follicles. All natural with none of the bad stuff and packaged in burlap and a 100 percent recyclable 2 ounce tin that is fully biodegradable and will not leach like a plastic container.